The I-90 Project, is a photographic narrative of Interstate 90 from Seattle, Washington to Butte, Montana and back again. There are 1,188 images (the number of miles traveled) taken over four years. I have journeyed along Interstate 90 from Seattle to Butte and back my entire life, mostly as a passenger. From my window I watch this strip of the world. Four years ago I started to document what I saw. The photos are taken through the window which acts as a secondary lens, giving the images intensified focuses and dreamy distortions. It also functions as a means to drive home the distance between the road and the places it passes through, and through reflection to place myself in that world. In capturing these moments along the highway I discovered a way to illustrate the feelings of isolation and intrigue that I experience on the road. The photographs in The I-90 Project capture moments that act as bridges between the liminal highway and the world it runs through. Through my camera I leave the highway and enter that other world for a split-second. By stopping the flow of the road I am able to connect to these places that are usually experienced as a blur. The initial count of photographs was over 10,000 images shot. I broke the project down into 4 sections of 297 images: Seattle to Spokane, Spokane to Butte, Butte to Spokane, and Spokane to Seattle. The distances between the places are not equal, but are instead based upon personal significance. I grew up in Seattle, and had one set of grandparents in Spokane, and the other in Butte, so for me that is how the journeys should break. The photographs were taken on four different journeys: going to my Uncle Stevie’s 50th Birthday party with my parents, going to my cousin Mike’s wedding with my parents, hitching a ride to Butte with my friend Suzanne when she was heading to Yellowstone, and going to my cousin Kelly’s wedding – one way with my Uncle Jim and Aunt Clare, and the other direction with my cousin Kathleen. They were all wonderful chauffeurs who were very tolerant of talking for hundreds of miles with a person who was turned away from them with her eyes and camera focused out the passenger window. 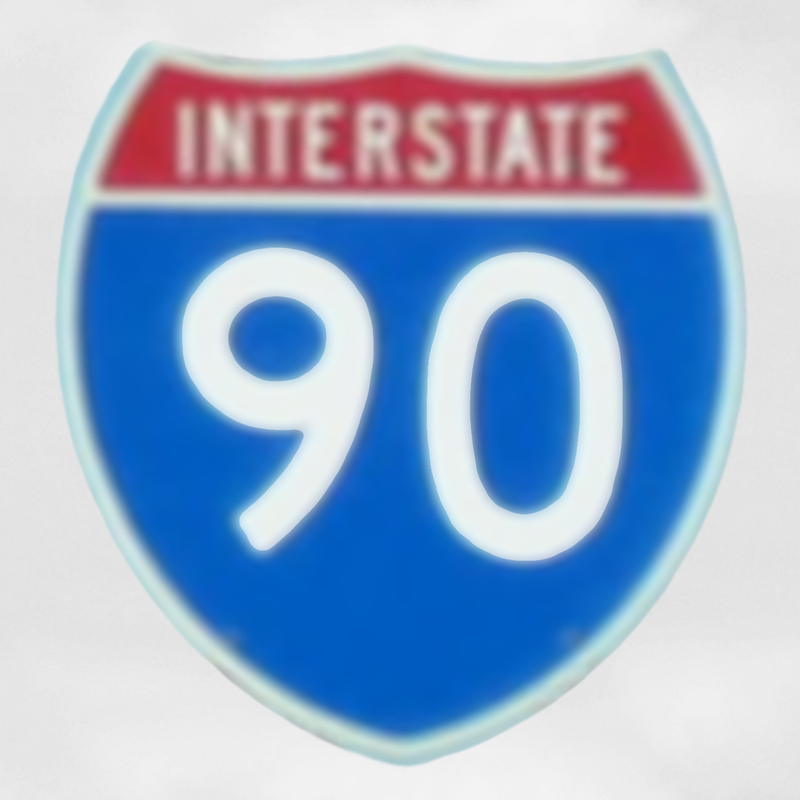 I chose to present The I-90 Project as a year-long time released website because I wanted a way to both release the images sequentially according to miles and also to indicate that the project is a singular whole not a collection of images. I have shown some of the images on their own and plan to do more of that in the future, but I have felt all along that they needed to be shown all together with their archival information. There are certain aspects of The I-90 Project that may cause consternation among more literal-minded viewers: First, the posts are title Mile 1, Mile 2, etc… but the images rarely correspond. Second, the posts jump from season to season. All I can say in response is that I am not literal-minded so my work rarely is either. The red doughnuts on the maps indicate where you are in the journey. The sayings on each sometime refer to the specific image, but more often have to do with the location and what I have come to associate with it over a lifetime of trips past. Some of the words I write myself, most are from Emily Dickinson, Emily Brontë, Dante Gabriel Rossetti, Edgar Allan Poe, Hermann Hesse, Italo Calvino, Oliver Wendell Holmes Sr., Charles Bukowski, James Joyce, Carl Sandburg, Walt Whitman, Charles Baudelaire, Erasmus Darwin, random romantic era poets, J. R. R. Tolkien, and many others. I have credited them all in the tags, but am having a snag with the showing of them. The I-90 Project has been a labor of love for me and I have had great feedback and support from my friends and family in the making of it. I am happy to have it slowly revealing itself to the world.